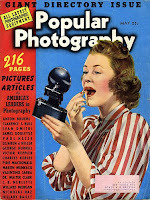 Fifty years ago this month the May 1959 issue of Popular Photography published a list of the ten greatest working photographers. The list was arrived at by polling 243 "eminent critics, teachers, editors, art directors, consultants and working photographers". As unscientific as this method may have been, I think it produced an accurate reflection of general U.S.-centric taste half a century ago. This was the short era sandwiched between Family of Man and Szarkowski and firmly occupied by the uber-reality hit series Leave It To Beaver. Who was popular in 1959? You tell me. The person who first correctly identifies the most names on the list wins the quiz and a free print. Please do not submit more than 10 names. Good luck. Too early for Robert Frank I think. Too late for Bourke-White, and Walker Evans (maybe). OK, I'll go with those ten. how about ansel adams, minor white, eugene smith, richard avedon, HCB, irving penn, dorothea lange, yusuf karsh, eisenstadt, ernst haas? were they all alive still? I feel young all of a sudden. Excellent guesses everyone. One person has 8 out of 10 right. I'm going to leave the contest open until Thurs at which point I'll reveal answers and name a winner. Congrats to Lester who got 10 out of 10. I thought Gjon Mili would trip people up since he's fallen off the radar. I think J. Karanka's list is even more interesting than the original list. Perhaps there's the root of another quiz there. Lester, please email me your address and I'll get your print out. thanks Blake, I received the print in Singapore this morning. wonderful!